When it comes to seasonal skin issues, winter isn’t the only time of year that has it out for your face. 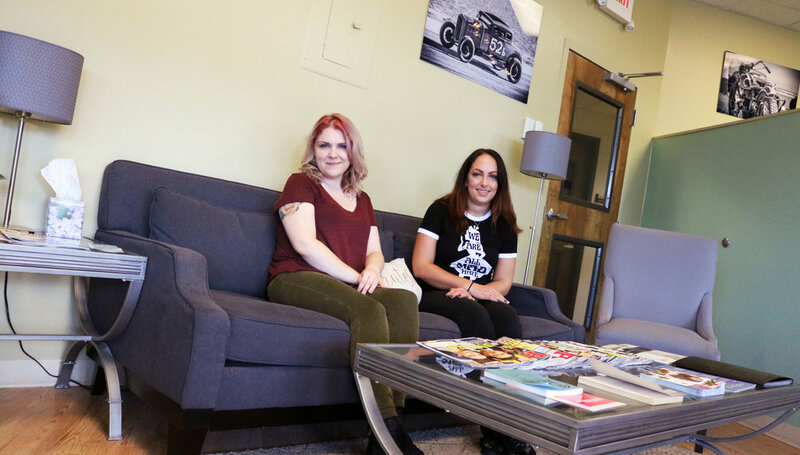 “During the fall, moisture in the air is constantly changing, and your skin is trying to change along with your environment.” explains Allison Holub, owner and master stylist at Sato Salon Organics in Allentown. The constant change in temp and humidity can make your skin dry out, weird out, and totally freak out. Heed this advice from Holub and Emily Neve, Sato’s makup artist. 1. Swap your makeup-removing wipes for organic coconut oil. Yup, that yummy cooking oil, smoothie add-in, and hair mask is also a fabulous makeup remover. This antimicrobial and anti-inflammatory fat removes even the most stubborn mascaras while leaving behind sweet-smelling moisture that penetrates deep into your skin. Nina’s tip: Cleanse first, then dip a cotton round (more surface area than a cotton ball) in coconut oil and wipe away the rest of the day. 2. Combat dryness with an oil serum. Oil is not the enemy—even if your skin is already oily. “Dryness and irritation, like the kind that you might experience in the fall, results in more oil production and breakouts!” says Holub. Adding oils at the serum stage of your skin routine will help combat seasonal dryness while balancing you out. Holub is working on her own oil serum for Sato, but choose one with high quality, organic ingredients and plenty of anti-aging vitamins, like Juice Beauty’s Antioxidant Serum ($45, Ulta). 3. Gently (!) scrub away the dullness. Much like your hair, your skin is prone to dullness as the season changes. Exfoliation lifts away the dead skin cells, revealing newer, brighter skin while encouraging quicker cell turnover. But gentle is the key word here—scrubs with harsh, sharp, or artificial (!) granules can aggravate sensitive skin and actually make cystic acne worse, says Holub. For a healthy and safe scrub experience, apply in upward-moving circles with your middle and ring fingers. So what should you look for in a scrub? Fine granules and healthy, nourishing fats. Sato produces two scrubs in-house, and they’re both made with coconut oil and super-fine sugar that melts when it comes in contact with your warm skin. Talk about #scrubgoals! Also, be wary of cream exfoliators, which often come with a host of chemicals. We’re a big fan of the Environmental Working Group’s website, SkinDeep, for info on our favorite beauty products. 4. Darkened up your hair? Adjust your makeup. Darkening your hair for fall is more than just an aesthetic choice. (link to hair story) Regardless of why you do it, Neve says your makeup needs to follow suit. “Don’t be scared! The leaves around you are embracing darker and warmer colors, and so should you,” she says. Dark hair color can wash you out, so bring warmth to your face by lightly contouring with a cool, dark powder—no orange! Lightly sweep it on where the sun would naturally hit your face: cheekbones, temples, bridge of nose and chin. Holub’s #protip: If you know you’re going to be photographed, sweep the bronze powder on your jawline for a more sculpted look. 6. Swap your tinted moisturizer for a cream-to-powder foundation and a good primer. Your tinted moisturizer’s sheer coverage was gorgeous for summer, but a drier, seasonally-challenged complexion needs the moisture and extra oomph found in a cream-to-powder foundation. The real key to success here: a clear mineral primer. “This helps create a really smooth palette for your foundation,” says Neve. Sallowness or too much yellow: Hit up a purple primer. Dull complexion: Brighten it up with pink. Purple-y dark circles or veins: Peach is your friend. Ruddiness and tired-looking skin: Mellow out with yellow. Beauty is just as much about what you put in your body as it is about what you put on your body. “Good hydration helps clarify your skin and keeps your eyes looking awake,” says Holub. We’ll drink to that!